How can we know who really wrote the Gospels? The four Gospels of the New Testament go by the name Matthew, Mark, Luke and John, which tradition holds are the authors of these stories. But how do we know who really wrote them? Couldn’t anyone have written them and claimed to be Matthew, or John? How do we really know the Gospels are actual accounts of Jesus and not accounts far removed of the people and events described? The conspiracy theories on this subject are vast. There is a group called the Jesus Seminar, and books like Bart Ehrman’s, Misquoting Jesus and Timothy Freke’s, The Laughing Jesus: Religious Lies and Gnostic Wisdom, all of which testify to the NT Gospels not being authentic firsthand accounts from the people from which the names are ascribed. So how can we know for sure just who wrote the Gospels? Today when you want to know who wrote a book you might flip to the copyright and publishing info in the first couple pages, or maybe even flip to the referenced sources to see how old they are to give you and idea of when the book was written. At the very least the author’s name will be printed largely under the title about 20 times in the pages preceding the actual text. But in Biblical times this was not the case. The earliest Gospel manuscripts didn’t have the author’s names printed up top like we find in our Bibles today. In fact, the first manuscripts to actually list the author’s names were from the 2nd century. And this is one of the many reasons conspiracies have evolved as to who wrote the gospels. Skeptics claim early Christians didn’t know who wrote the Gospels and that even if they did, the information was long lost. For example, Ehrman references the fact that the gospels are not written in first person narrative, but in third person narrative, which is evidence they are not firsthand accounts. He also points out that neither author claimed to be a direct eye witness. Freke claims that the gospel’s authors weren’t even determined until AD 180 by Irenaeus who attributed them to Matthew, Mark, Luke and John. But these claims aside there is something that should be addressed. Even if the four Gospels weren’t written by Matthew, Mark, Luke or John, would that make them any less true? It is entirely possible for the story of Jesus as written in these accounts to be word for word true to history despite not being written by any of the now recognized authors. Regardless, in response to Freke’s claim, the book of John does in fact make a claim it is an eye witness account; John 19:35. The book of Luke does as well at Luke 1:2. But skeptics say they just as easily could have been lying. How do we know they’re telling the truth? The Gospel of Thomas claims to be telling the truth as well, yet Christian scholars discount it as a genuine source. It is possible to determine the appropriate authors by understanding three issues; when the Gospels were written, witness accounts outside the Bible, and internal components of the Gospels. Timeline: When the Gospels were written. History has taught us that different eras in time present differences in style of writing, type of ink and type of paper used by writers and scribes. Historians have particular ancient texts that give exact dates as to when they were written, so by matching up ink, paper, and writing style to those dated texts we begin to see just how old the manuscripts in question are. 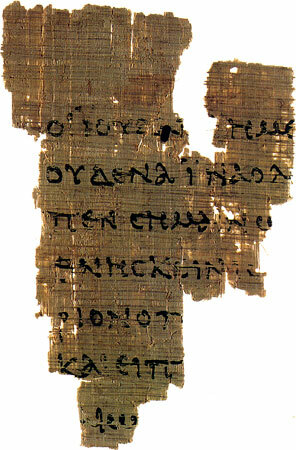 Papyrus 52 is a manuscript fragment containing John 18:31-33, with the reverse side containing John 18:37-38. And based on its composition it is known to have originated sometime in the late first century or early second century. Furthermore the fragment was determined to have originated in Egypt, meaning that by the end of the first century (or early second century), the gospel accounts were already circulating inEgypt. This would necessitate Jesus’ life story being compiled prior during the latter half of the first century while the witnesses to Jesus would have still been alive. There are also other manuscripts such as Papyrus 66 and Papyrus 90, both copied in the late second century. Papyrus 64, 103 and 104 contains fragments of the Book of Matthew, copied in the second century. Papyrus 4 and 75 contain fragments of the book of Luke copied in second century. Again, if these Gospels were circulating around theRoman Empire by the second century, then they had to have been written originally in the early 100s. Now, you may be thinking, what about the Gospel of Mark? Well, the book of Mark is the shortest of the gospels, and Matthew and Luke have many similarities to Mark. It is suggested that Matthew and Luke referred to Mark, which suggests Mark was in existence before Matthew and Luke. You might be shocked by the fact that a gospel author would refer or borrow information from another gospel, but there really is no issue considering Luke opens up in the first chapter in his book by claiming that his account is a collection of accounts from eye witnesses and others who have already taken it upon themselves to write an account of Jesus: “Many people have set out to write accounts about the events that have been fulfilled among us. They used the eyewitness reports circulating among us from the early disciples. Having carefully investigated everything from the beginning, I also have decided to write a careful account for you…” Luke 1:1-3 (NLT). Another interesting theme found among the Gospel authors is that none of them spoke of the temple being destroyed. The temple was destroyed in AD 70, yet none of the authors wrote of its destruction, but instead of Jesus visiting the temple multiple times and going inside to teach. If the gospels were written much later, surely the temple being destroyed would have been mentioned, but it is not, testifying to the gospel authors recording eye witness testimony prior to AD 70. Also, Luke wrote the book of Acts after he wrote his gospel account. Acts was written to document the history of the early church. Yet the book of Acts also doesn’t reference the destruction of the temple. It also doesn’t mention Nero’s persecution of the Christians in AD 64, the death of James in AD 62, the death of Paul in AD 64 and the death of Peter in AD 65. This would lead one to conclude Acts was written prior to these events, so possibly prior to AD 62. And since the book of Luke was written prior to Acts, it was surely written even earlier. When we historically study the manuscripts that weren’t titled with the ones that were titled with an author, there is no name variance. In other words, as soon as we’ve found one Gospel titled Matthew, all subsequent Gospels (of the same Gospel of Matthew) were named Matthew. We’ve never found a Gospel of Matthew named Philip or Andrew. This goes the same for Mark, Luke, and John. Thus further confirming the authorship of the Gospels was well known. So by studying the oldest manuscripts we have, we can conclude that all four Gospels were well in circulation throughout theRoman Empireby the second century. Which would mean the Gospels were written originally prior in the first century while the witnesses to Jesus’ life were still well alive, just as Luke claims. Such close proximity to the events recorded would prevent any legends from developing. Considering how long it normally took historical accounts during this time to be constructed, the fact that the Gospels were written so soon after the events occurred is incredible. Relatively speaking they were like a news flash. Witness accounts outside the Bible. There is testimony from men in the second century that confirm the origin of the Gospels. Papias of Hierapolis was a pastor of Hierapolisin the area now known as Turkeyduring the late first to early second century. As recorded by Papias, “The elder said this: Mark, who became Peter’s interpreter, wrote accurately as much as he remembered- though not in ordered form- of the Lord’s sayings and doings. For [Mark] neither heard the Lord not followed after him, but later he followed after Peter, who was giving his teachings in short anecdotes and thus did not bring forth an ordered arrangement of the Lord’s sayings; so, Mark did not miss the point when he wrote in this way, as he remembered. For he had one purpose: To omit nothing of what he had heard and present no false testimony in these matters… And Matthew, in Hebrew dialect, placed the saying in orderly arrangement.” Thus confirming Mark and Matthew each as an author of a Gospel account. Papias may have even written about Luke and John, but unfortunately what we have of Papias’ writings is only small fragments. We do know that he wrote the text quoted here around AD 110. Another pastor named Polycarp of Smyrna, was born around AD 70, and was a student of John, one of Jesus’ disciples and a direct eye witness. He wrote, “Matthew composed his gospel among the Hebrews in their language, while Peter and Paul were preaching the Gospel in Romeand building up the church there. After their deaths, Mark- Peter’s follower and interpreter- handed down to us Peter’s proclamation in written form. Luke, the companion of Paul, wrote in a book the Gospel proclaimed by Paul. Finally, John- the Lord’s own follower, the one who leaned against His very chest- composed the Gospel while living in Ephesus, in Asia.” As you can see, both Polycarp and Papias both wrote of the authorship of the four Gospels in extremely close proximity to the time when the gospels were first circulating around the Roman Empire, thus concluding that the authorship was not falsely determined hundreds of years later, or was lost over time. Eusebius, a bishop from Casesarea from the 3rd century, wrote that Matthew first wrote his Gospel account while in Palestine, and left Palestine 12 years after Christ died. If Eusebius is correct, that means Matthew wrote his gospel as early as AD 40 to AD 45. And if Matthew was indeed based off of Mark, then that pushes the origin of Mark back even further. Those skeptics who maintain the conspiracy that the authorship wasn’t determined until hundreds of years later (believing Polycarp and Papias to be liars or their writings falsified) fail to acknowledge the number of manuscripts widely circulating in the Roman Empire. There wasn’t a central authoritative church until the 4th century. So the first, second and third centuries were ones of widely dispersed small churches. How could it be possible to assign authorship so long after the mass circulation of the gospels? It would be impossible to track down every manuscript at every church and assign authorship. Yet we can see from testimony above it was already well understood who authored each Gospel, right from the beginning. In addition, the internal components of the Gospels should not be over looked as well. Take the book of Matthew for example, which described Matthew as a “tax collector.” First, tax collectors were despised in the Roman Empire, and any new religion looking to make up divine story to convert people wouldn’t dare used a despised tax collector as a disciple. But more importantly, what needs to be understood is that during the first century, those who could read and write were not common. However, tax collectors did in fact know how to read and write. In fact, tax collectors usually carried pinakes (sheets of wood covered in wax) and styli (metal or bone used to write in the wax) which they used to make notes, which they could later transfer onto papyrus to give back receipts to the tax payers. So Matthew being a tax collector could read and write well thereby making it likely that we would in fact be one of the disciples to write an account of Jesus’ life. Just as Luke being a physician would make him a likely person to be able to write a Gospel account himself. Peter being a humble fisherman on the other hand would have Mark record his account. Some other great examples that the Gospels were indeed direct accounts or collected accounts from eyewitnesses: The description of home construction in the book of Mark is consistent and accurate with historical first-century housing is that area. The Gospels record highly accurate knowledge of how the Jewish communities were organized during this time: Pharisees, Sedducess, etc. The torture and punishment of Jesus by the Roman authority concurs with methods of documented by the Romans. The book of Luke refers to many locations and geographical features that are accurate to the point that only someone who physically traveled to these locations could have written of them. Based on the available evidence we can see that the Gospel of Mark was testimony of Simon Peter recorded by John Mark. The Gospel of Luke is a collection of accounts as recorded by Paul’s physician Luke. The Gospel of Matthew came from Matthew’s own testimony of Jesus, as did the Gospel of John come from John, or perhaps one of John’s students that recorded his teaching. The Jesus Seminar is another major adversary to the Gospel accounts being genuine accounts of Jesus. Started in the 1970’s by Robert Funk, their goal was to “rediscover” the Jesus of 2000 years ago that they believed has been misrepresented by 2000 years of myths, legends and traditions. The scholars of the seminar go through the four Gospels and determine whether or not Jesus actually said the phrases recorded in the Gospels. There are two problems with this: First, despite the insurmountable proof that the Gospel accounts have been copied accurately since their origin, these scholars feel they’re educated enough to determine what Jesus actually said 2,000 years later… over the four eye witness accounts written down less than 100 years from the lifetime of Jesus. Second, all these scholars up front admit they do not believe Jesus was the Son of God and savior of mankind nor did He have supernatural powers, etc. So what conclusions do you think such biased scholars are going to come to? I consider their findings to be that of conspiracy because their claims are based not on hard evidence but instead based purely on speculation which is driven by their presuppositions against Jesus to begin with. In the end, their Jesus was one striped of any divinity, left as nothing more than a wise man. There is a gap conspiracy theory also. How come the gospels were written years after Jesus and not immediately after his death? Some suggest foul play. That the gap between when Jesus died and the gospels were written is suspicious, and there is often speculation that the truth has been skewed in that time gap. However, the reason for the time gap is because of the usage of oral tradition. In between this time the apostles were spreading the message of Christ via oral tradition. Towards the end of their lives they decided to record the events they had witnessed as they would no longer be able to verbally compel it to any one once they had died. This is also confirmed by Polycarp’s quote earlier. In conclusion, when we study the timeline of when the gospel accounts were written, the recorded testimony of men outside the Bible, and the internal components of the gospel narratives, it becomes evident that the gospel accounts were written by Matthew, Mark, Luke and John. They were not written hundreds of years later by a Church authority to substantiate the claims of their mythical Jesus. To claim such, is to ignore the available and rational evidence. Timothy Freke and Peter Gandy, The Laughing Jesus: Religious Lies and Gnostic Wisdom (New York: Three Rivers, 2006) Pg. 69. Papyrus 75 contains both fragments of the book of Luke and John. Eusebius of Caesarea, Ecclesiastical History Vol. I, Loeb Classical Library, ed. K.Lake (Cambridge, MA: Harvard University Press, 1980) 3:39. Eusebius writes of Papias during Trajan’s reign prior to AD 107. Matthew and Luke being based off Mark is a speculation. A. R. Millard, Reading and Writing in the Time of Jesus. (New York:New York, University Press, 2000) Pg. 31, 170. In ancient times, the only way to communicate history most of the time was through oral tradition. They did not have laptops, typewriters or a pen and paper available (those who could read and write were few), so a speaker would announce his story to a community of people publicly. In turn, the community would correct the speaker or speak up if they disagreed or knew that what the speaker was saying was indeed false. Through this method, communities and civilizations would carry on historical events accurately through generations. In fact, archeology scholars know through their discoveries that oral tradition contained very little to no errors through hundreds of years of transcendence. Through this method ancient civilizations did pass down to their later generations, accurate safe guarded information. What makes it “NUTS” ? “There is no reason to believethat any Gospels were written later than A.D. 70,” -Dr. William F. Albright, Archaeologist. As quoted in: Little, P.E., (2000) “Know Why You Believe,” 4th Ed., (Downer’s Grove, IL: InterVarsity Press) pp. 41-42. “Only when the Apostles began to die off and the return of the Lord did not transpire as expected was the need perceived for a written account… Long before the printed word, the centrality of memory in community cannot be overstated. In such an environment, the events and words of Jesus were replayed and recalled hundreds and thousands of times by those who were present with him, beginning during Jesus lifetime and continuing for decades through countless retellings. “The interval, then, between the dates of the original composition and the earliest extant evidence becomes so small as to be in fact negligible, and the last foundation for any doubt that the scriptures have come down to us substantially as they were written has now been removed. Both the authenticity and the general integrity of the books of the New Testament may be regarded as finally established,” -Sir Frederic Kenyon, Paleographer and Bible Scholar. -Kenyon, F., (1959) “The Bible and Archaeology,” as written in F.F. Bruce’s The New Testament Documents: Are They Reliable?, (Grand Rapids, MI: Eerdmans) pp. 12-13.